Specification Includes: 1 Former Keeper, Automatic, Full Audi Service History, Half Leather Interior, 19 Inch Alloys, Keyless Entry and Go, Satellite Navigation, Front and Rear Sensors, Electric Tailgate, Electric Heated Mirrors, Paddleshift, Dual Climate Airconditioning, Bluetooth, DAB, BT Audio, AMI, CD, Automatic Xenons, Privacy Glass, 3 Months Extendable AA Warranty and 12 Months AA Roadside Assistance Included, Delivery Available, Fleet Sales of Cosby South Leicestershire are Pleased to Present a Wide Range of Vehicles Selected . All Of Our Vehicles are Fully Checked And Prepared to Meet The AA DEALER PROMISE of Which We Are an Accredited Approved Dealer. Our CLICK and COLLECT Finance Packages are Available in Most Cases and Include Zero Deposit And Low Rate Options (subject to status). We Aim to Offer an Immediate Drive Away Service Making Your Buying Experience Fast and Effective. Specification Includes; Service History, Satellite Navigation, Half Leather Interior, 18 Inch Alloys, Multi Function Steering Wheel With Cruise and Paddleshift Controls, Optical Front and Rear Parking Sensors, S Line Exterior Package, Dual Zone Climate, MMI, Xenon Plus Headlights, Bluetooth Telephone and Media Interface, Front Sports Seats, LED Daytime Running Lights, 3 Months Extendable AA Warranty and 12 Months AA Roadside Assistance Included, Delivery Available, Fleet Sales of Cosby South Leicestershire are Pleased to Present a Wide Range of VW Group Direct Supplied Vehicles. All Of Our Vehicles are Prepared to Meet The AA DEALER PROMISE of Which We Are an Accredited Approved Dealer. Our CLICK and COLLECT Finance Packages are Available in Most Cases and Include Zero Deposit And Low Rate Options (subject to status). We Aim to Offer an Immediate Drive Away Service Making Your Buying Experience Fast and Effective. Specification Includes; Satellite Navigation, Optical Front and Rear Parking Sensors, Half Leather Interior, Multifunctional Steering Wheel With Cruise Control, Automatic Xenon Lights, 18 Inch Alloys, DAB Radio, Audi Service History, MOT Until January 2020, Bluetooth Telephone Connectivity, 2 Keys, Climate Control, 3 Months Extendable AA Warranty and 12 Months AA Roadside Assistance Included, Delivery Available, Fleet Sales of Cosby South Leicestershire are Pleased to Present a Wide Range of VW Group Direct Supplied Vehicles. All Of Our Vehicles are Fully Checked And Prepared to Meet The AA DEALER PROMISE of Which We Are an Accredited Approved Dealer. Our CLICK and COLLECT Finance Packages are Available in Most Cases and Include Zero Deposit And Low Rate Options (subject to status). We Aim to Offer an Immediate Drive Away Service Making Your Buying Experience Fast and Effective. Specification Includes: Full Audi Service History, Electric Heated Folding Mirrors, Cruise Control, 17 Inch Alloys, Auto Lights, Bluetooth Telephone and Media, Remote Locking, Front and Rear Electric Windows, Daytime Running Lights, Dual Climate Control, Air Conditioning, ISOFIX, 2 Keys, 3 Months Extendable AA Warranty and 12 Months AA Roadside Assistance Included, Delivery Available, Fleet Sales of Cosby South Leicestershire are Pleased to Present a Wide Range of VW Group Direct Supplied Vehicles. All Of Our Vehicles are Prepared to Meet The AA DEALER PROMISE of Which We Are an Accredited Approved Dealer. Our CLICK and COLLECT Finance Packages are Available in Most Cases and Include Zero Deposit And Low Rate Options (subject to status). We Aim to Offer an Immediate Drive Away Service Making Your Buying Experience Fast and Effective. Compact practicality is what the Audi Q3 is all about. This SUV boasts coupé-like styling, an elevated driving position, plenty of space within the cabin plus high ground clearance. Whether you're off on the school run or tackling a dirt track in the middle of the country, this practical, compact SUV will get you to your destination safely and in style. 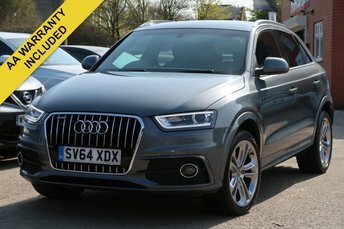 Find out more by viewing the complete range of used Audi Q3 models for sale in Cosby here on the website. You can also contact a member of the team at Fleet Sales if you'd like further details or are ready to arrange a test drive. Rest assured that all of our vehicles are inspected before arriving on the forecourt, meaning you can buy in confidence.